Yay! No fruit! (Or, to be precise, no identifiable bits of fruit!) This week’s Tuesdays With Dorie pick (courtesy of Ashlee of A Year In The Kitchen; head on over there if you’d like the recipe) had a much subtler fruit presence than most of the recent recipes. 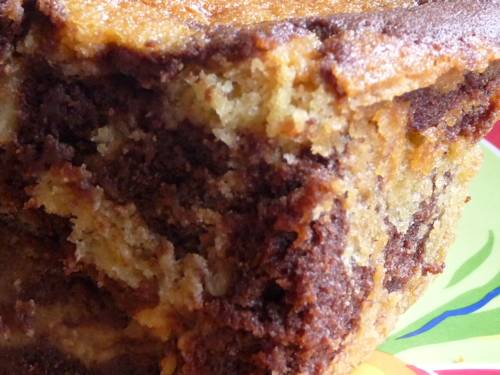 It’s essentially a banana pound cake; half of the batter is mixed with chocolate, then the yellow and brown batters are swirled to make a lovely marble cake. So the finished cake was not the prettiest thing I ever made (although Sunday’s challah may have been), and I don’t think it was entirely baked in the middle. But it was delicious, especially drizzled with homemade chocolate syrup. Husband said it seemed more like a quick bread than a pound cake, but he’s insane. It wasn’t entirely pound cake-y, but I think that’s because it didn’t bake long enough. 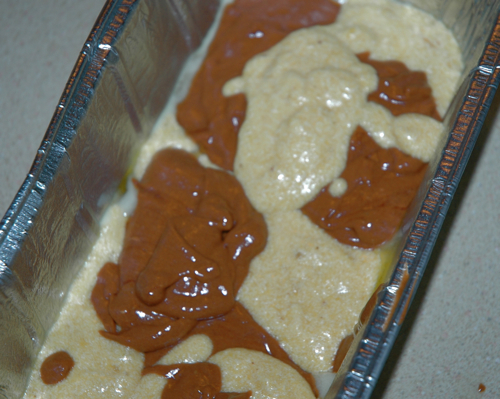 The finished product was moist and dense and banana-y and chocolate-y and really all you could ask for in a cake. This one’s a keeper. Go and make it. Now. And check out everyone else’s versions at Tuesdays With Dorie. This entry was posted Tuesday, August 5th, 2008 at 8:00 am	and is filed under Uncategorized. You can leave a response, or trackback from your own site. After looking at all these posts. I’m beginning to realist that maybe the super-moist situation is perhaps normal. Maybe mine is not a failure after all! I was very happy when I found out that we were doing this! No fruit! Yipee! Great job! Love the chocolate sauce! I used mini disposible loaf pans, and got the bread to come out fairly well… Nice photos! Okay – the chocolate – that would have made the difference for me. Great job. I’m sick of fruit, too! Isn’t that terrible? Bring on the chocolate!!! Oh the chocolate sauce is making me drool! Looks great! Homemade chocolate syrup? Yes please! My batter was pretty thick, too. That last picture is evil incarnate! YUM! So very moist! 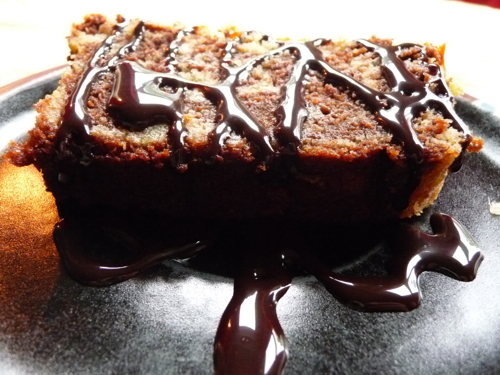 Drizzled in homemade chocolate syrup, that piece of cake looks absolutely sinful. I love that you drizzled some chocolate on it. I have to try that next time!